This short piece was originally written for the Museum of Contemporary Craft whose 2013 exhibition “Object Focus: The Bowl” put its emphasis not simply on the bowl, as curator Namita Wiggers put it, but on “the bowl as a cultural archetype.” Although bowls undoubtedly enjoy anthropological and archeological significance, they are typically neither commonly examined nor critically reviewed. To MoCC’s credit, the exhibition and its attendant programming made a concerted effort to see the familiar form of the bowl anew, and to demonstrate that the staid, one-size-fits-all Platonic idea[l] of a bowl that we all tend to have in our minds is, in fact, in urgent need of an upgrade and expansion. Since The Professor reflected upon the Foam Bowl for MoCC [designed by Marcel Wanders and produced by the Dutch company Moooi] a little over a year ago, he has learned more about it, had further experiences interacting with it, and, not surprisingly, his thoughts about this bowl have evolved and expanded such that he now considers it from a different perspective. 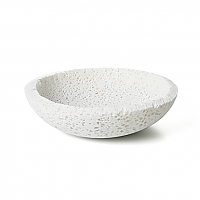 To begin with, the Foam Bowl’s holes not only render it useless in meeting the bowl’s primary function of containment. They also fool the eye. The Bowl appears as if it should be smaller and softer than it is; holding it in the hands, however, reveals that it is decidedly hard, surprisingly rigid and downright unforgiving. As a vessel, it is not something that the hand will enjoy engaging with or that fingers will want to linger over or idly caress. Instead, it is by intent a bowl of limited [rather than universal] utility; eating from it is technically possible but not at all probable so it’s fair to say that consumption is not part of its functional agenda. Yes, it could serve/act as a fruit bowl but the Foam Bowl really succeeds only as an ironic statement and as a material experiment. Ultimately it is an interesting failure, not just because of its porosity [which is actually bone-like and therefore of interest for its biological reference] but because of its lack of emotional ergonomics, its ripping harshness to the touch, and its elevated consumer-unfriendliness quotient. In these ways, the Foam Bowl, as iconic as its form is, denies the very essence of its bowlness. The Foam Bowl’s meaning, both fleeting and enduring, can be located at the center of a three-set Venn-diagram at the intersection of art, craft and design. The Foam Bowl is a higher-level attempt to redefine what it is that a bowl means, what it means to be a bowl. It prefers to raise questions about the bowl as an archetype rather than provide answers, and it does this by addressing “the idea of the bowl” with the bowl itself playing second-fiddle to material rendition. That’s why the Foam Bowl isn’t a bowl at all—it’s the Anti-Bowl—and that’s why they call me The Professor.